So wanted to do this for some time now and got the chance to do this now as I wanted to share something new everyday. 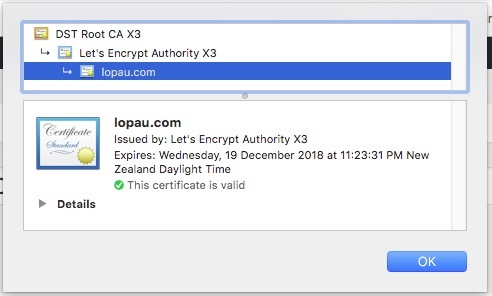 Let’s Encrypt is a free, automated and open Certificate Authority. Today I learned it was not straight forward to install. I first tried to add the ppa certbot and when I tried to install python certbot app I got errors on dependencies. I then tried certbot-auto script which was successful but my site was still not showing as being secured by SSL. Finally the following worked for me. That should get your going. On my next tutorial, I’ll show you to setup a cron job to auto renew the certificate.